Mintwood Home Furniture // Chic Dressers, Bar Carts, Rugs, Lighting and more! Taking a break from my usual fashion posts to highlight some gorgeous furniture and decor I found this week! I love brainstorming new spaces and get totally inspired by even just one item – this time it was this rug. It definitely has some similarities to the rug in my living room, but features a bit more color throughout. I’m loving the cream + blue combo, which you’ll definitely see a bunch of in my own living room! In my room however, the blue is more of a soft teal. I’m about a month away from finally receiving my couch which I am SO excited about! It’s the most beautiful tweed-esque fabric Maddie (my interior designer!) and I discovered at Lee Jofa here in Dallas. It looks stunning against the rug, and although it is more color than I originally planned on I know I am going to absolutely love it! Once the couch comes in, Maddie and I will decide on a pillow fabric or two, but I think I have my choices narrowed down to just three already so the decision should be easy. Right now Maddie and I are working on what chair shape to go with (we already selected the fabric) for placing opposite the couch. 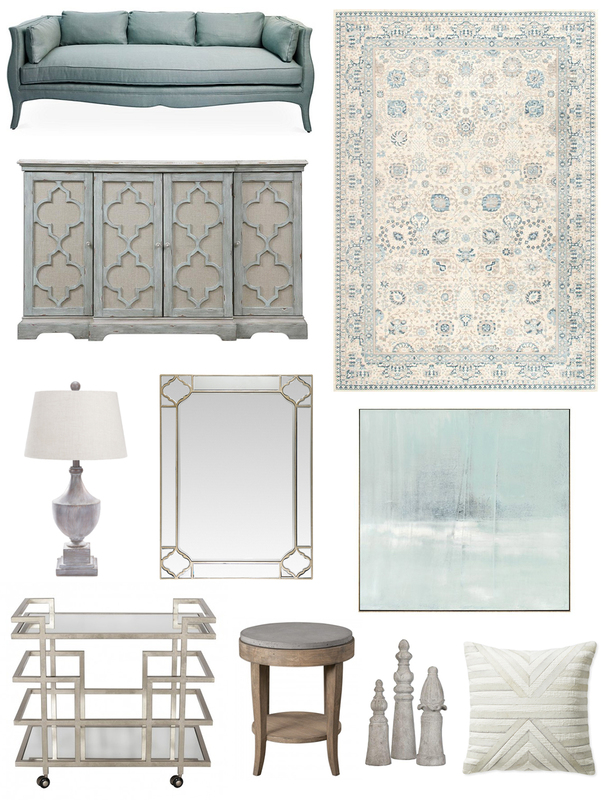 Stay tuned for more house updates and shop all these fab home finds below!